You want to address your visitors before they leave you website? Learn how in a few simple steps. Exit pop-ups are a great way to reach visitors when they are about to leave your website, and you can easily set up exit pop-ups with WisePops. How do exit popups work? To detect a visitor exit, we track your users' mouse movement. 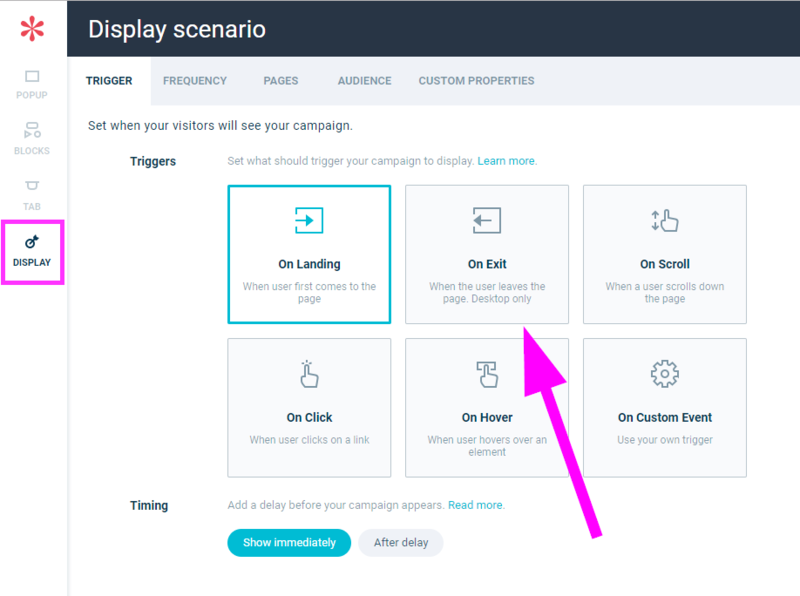 When your visitors are about to close the page they're on, they have to move their mouse upwards to reach for the close option. We detect and interpret this mouse movement as an exit and will trigger your popup. If you want to preview your exit popup, just repeat the mouse trajectory as if you were to close your tab or browser. As we rely on mouse movements to anticipate exit, we can't detect exit on tablets and phones. For these devices, you can check this article. To do so, open your popup, click "Display Scenarios" and select "On Exit", it's that simple! For additional tips, make sure to check our extensive article about exit popups.